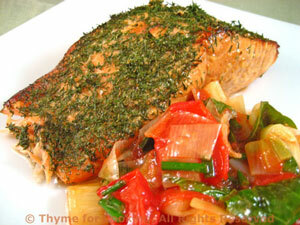 Grilled Salmon with Warm Tomato Leek Salsa, quick, easy gourmet dinner. Nothing says spring quite like a simple Pasta Primavera - and Salmon done on the barbecue served with a fresh, herb-flavored salsa. Salmon is the perfect fish for grilling and smoking: a light brushing of olive oil and a few herbs are all it needs. Put salmon in a grill basket or on mesh grill pan. Brush fish with the olive oil and sprinkle with herbs. Grill for 5 - 7 minutes a side, depending on thickness. OR put on baking sheet and roast in 400 F (200C) oven for 15 - 20 minutes, depending on thickness. In both case salmon will be done when it flakes easily, slightly pink in the center is fine. Remove from heat, sliding it off the skin if needed. Clean leek and slice thinly, using up to the thick, dark green. Add leeks and sauté until tender, about 7 minutes. Add tomatoes and sauté 5 minutes longer. Add herbs, stir and remove from heat. Keep warm (but not hot) until ready to serve. 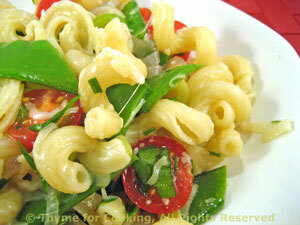 A colorful Pasta Primavera - or spring pasta dish. Don't start the sauce until the pasta is cooking, it only takes 10 minutes and you don't want it over-cooked. Trim and slice green garlic. Trim and slice snow peas in thirds. After pasta has started cooking: Heat olive oil in a large skillet. Add green garlic and sauté 3 minutes, until starting to get tender. Add snow peas and sauté 2 minutes longer. Add stock, herbs and bring to a simmer. Add drained pasta and stir to combine. Add cherry tomatoes, stir, put into a large serving bowl.